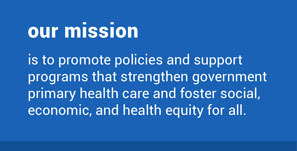 In Côte d’Ivoire prevention of mother-to-child transmission of HIV (PMTCT) has been national policy since 2004. In November 2012, the Côte d’Ivoire Ministry of Health and Public Hygiene (MSHP) transitioned to a universal antiretroviral therapy-based treatment regimen for pregnant women. This treatment regimen—called ‘Option B’ by the WHO—promised the potential to substantially reduce HIV transmission from mother to infant. However, Option B has been difficult to implement in the real world, including in Côte d’Ivoire. 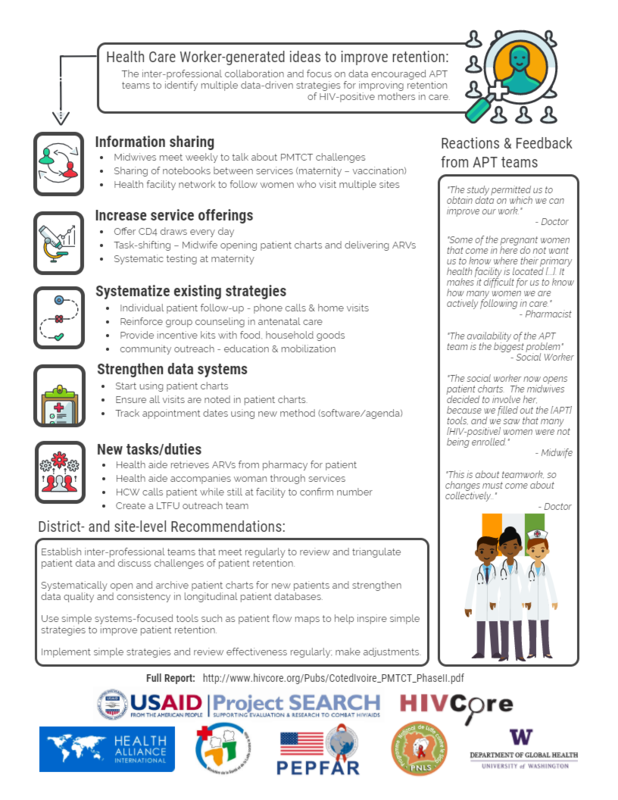 A 2014 PMTCT cascade evaluation conducted by a consortium of institutions—including the MSHP, the University of Washington (UW), HAI, the University Alassane Ouattara (UAO), and the Côte d’Ivoire National Institute of Public Health (INSP)—demonstrated substantial health systems obstacles at various points in the PMTCT cascade. 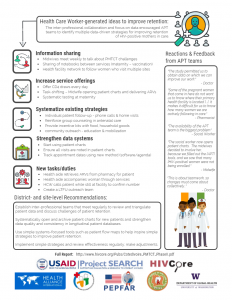 In 2015-16, HAI and the MSHP’s National HIV/AIDS Program (PNLS) teamed up to apply those findings to identify better methods for identification, follow-up, and care of HIV-positive mothers and children on antiretroviral therapy. 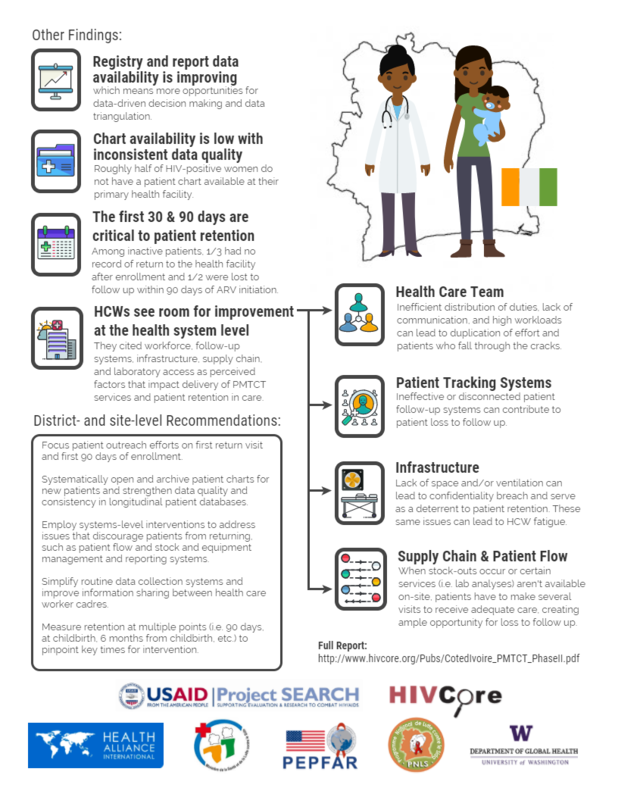 This national level study included fifty health facilities from across Côte d’Ivoire to identify interventions or health systems modifications that would ensure high quality, accessible health services are available to HIV-positive women, children, and their families. 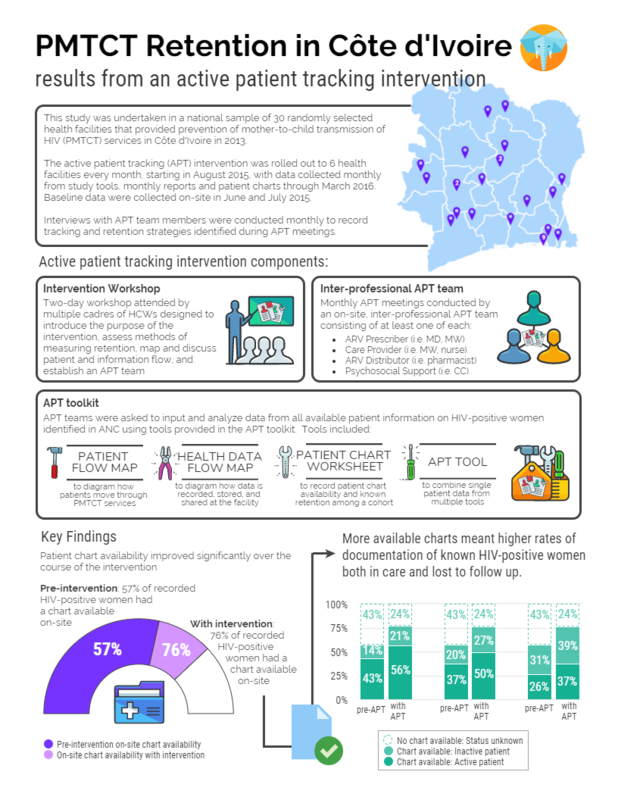 It also included strategies to improve monitoring and evaluation of HIV data, so health facility managers have a better idea of who is coming through their facility and how they are doing on treatment. Following the October 2015 transition of Côte d’Ivoire’s national PMTCT policy to the WHO’s ‘Option B+’ strategy—which extends antiretroviral therapy among HIV-positive pregnant women to lifelong treatment—the study findings, showing large gaps in patient tracking and retention, provided a key area of focus for maximizing the impact of clinical intervention in a real-life setting. Click on the thumbnails below to read more about the findings of the study. 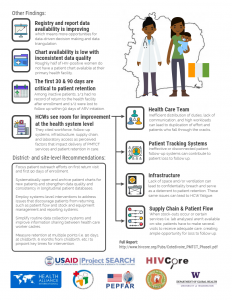 This project was made possible by the President’s Emergency Plan for AIDS Relief (PEPFAR) and the US Agency for International Development (USAID) via HIV Core, a Task Order funded by USAID under Project SEARCH.